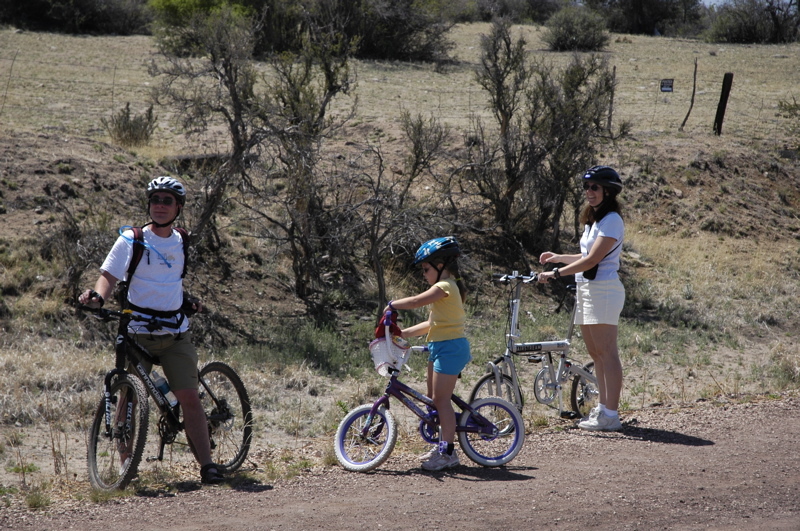 Prescott continues to amaze … the recreation here is fabulous. 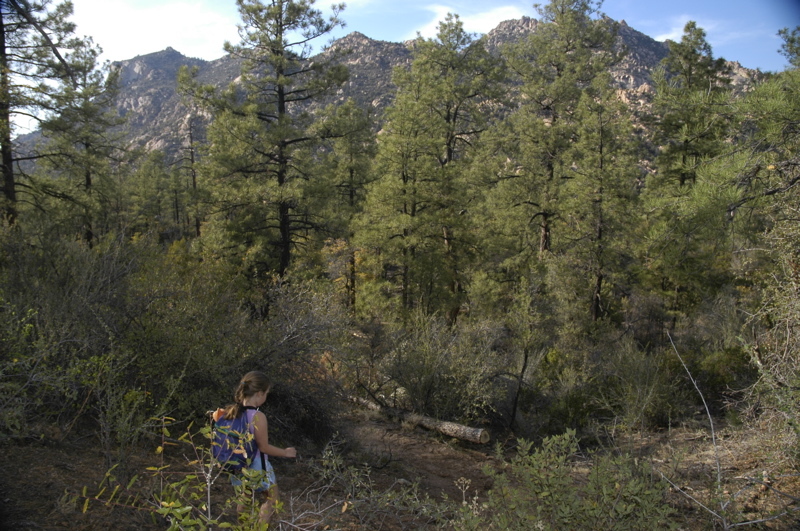 This afternoon Rich C took us to the Granite Mountain Wilderness area inside the Prescott National Forest. Like all the great recreation here, this was very close to town. 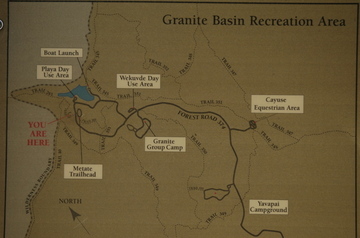 We went for a short hike, about 3 miles roundtrip, to see some of the great climbing areas. 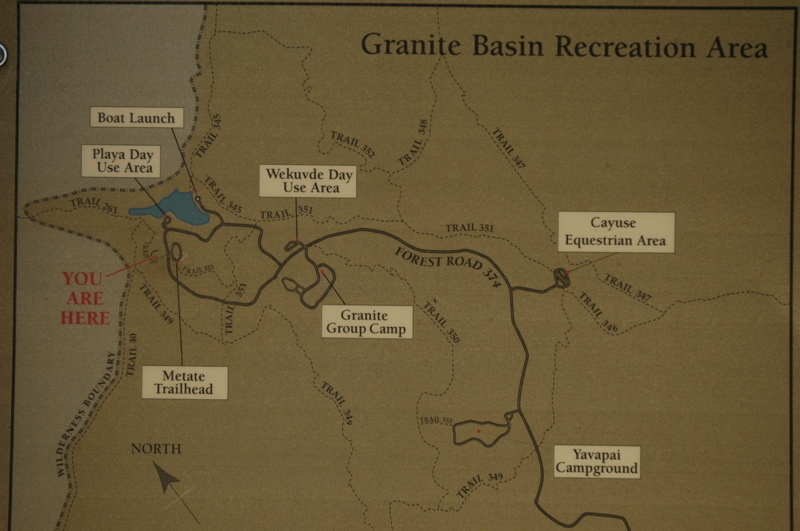 There’s also a campground in the National Forest, called Yavapai. 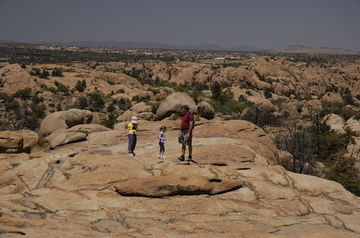 The hiking was easy on a trail called only “261”, but the granite boulders are extremely rough to the touch and take a heavy toll on the skin of climbers. Still, we tried a little easy rock climbing after the hike, and Emma seems to be very interested in it, even with the rough granite. From our campsite, it’s an easy scramble up to a section of the Dells where the views are panoramic. Emma has gotten in the habit of going up every evening to take sunset photos. This evening Rich C and I accompanied her. It’s an incredible thing to just walk out our door and into this amazing granite playground. None of us want to leave, so I think we will extend yet another day. This morning Brent and Tiffany packed up their Airstream to head back home, but we decided to stay on for a couple more days. 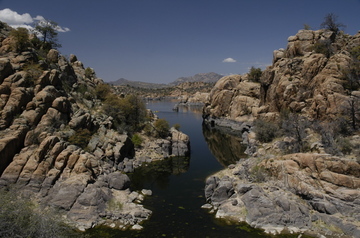 Prescott is full of great recreation (hiking, cycling, boating), the camping is cheap, and the weather is beautiful this time of year. Just around the corner from our campground is an abandoned rail line that has been turned into a multi-use trail. It’s the former Santa Fe, Phoenix & Prescott line, which served mines from Crown King (54 miles from here) down to Phoenix. Rich C led us on a trip up the trail, past Lake Watson. Emma’s legs were a little sore from all the rock scrambling of yesterday, so she and Eleanor bailed out after about two miles, but Rich C and I checked out about six miles of the trail. So far that’s all that you can ride, but the trail will eventually go much further. The views as the trail works through the granite dells are absolutely fantastic. The granite has eroded into magnificent spires, balls, crevices and grikes. Looking at them is like studying clouds, with an endlessly changing arrangement of imaginary things floating by. 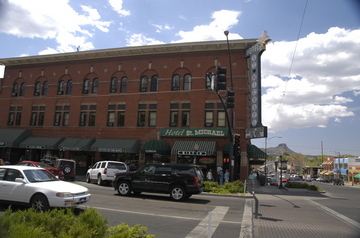 Rich C and I went out for lunch at the historic Hotel St Michael in downtown Prescott. It’s rare to find a downtown early 20th century hotel still in operation. Most seem to be victims of urban renewal, blight, or lack of parking. This one appears to still have a lively lodging business, restaurant, and a small mall. Being down in southern Arizona I’ve forgotten the variety of weather that most other parts of the country enjoy. 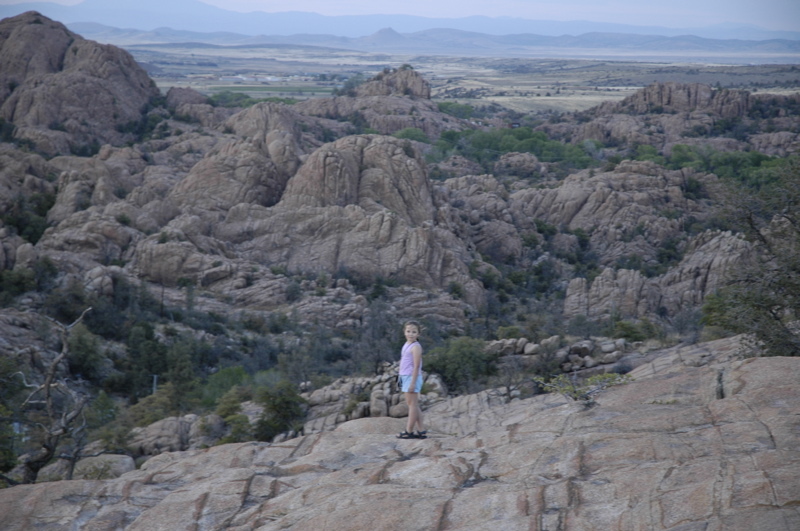 But up here in Prescott (elevation 5300) anything can happen. This afternoon we abruptly went from sunny, dry and upper 70s to rumbling thunder and spitting rain. It doesn’t rain a lot here but the thunderstorms can be dramatic. Now it’s in the 50s and dropping while the trees sway in the gusty wind. It’s a neat change to see a little weather again. But having had a taste, I won’t mind returning to the scorching dry desert next week. I missed a blog entry last night. I can only plead distraction — Friday was a very busy day. 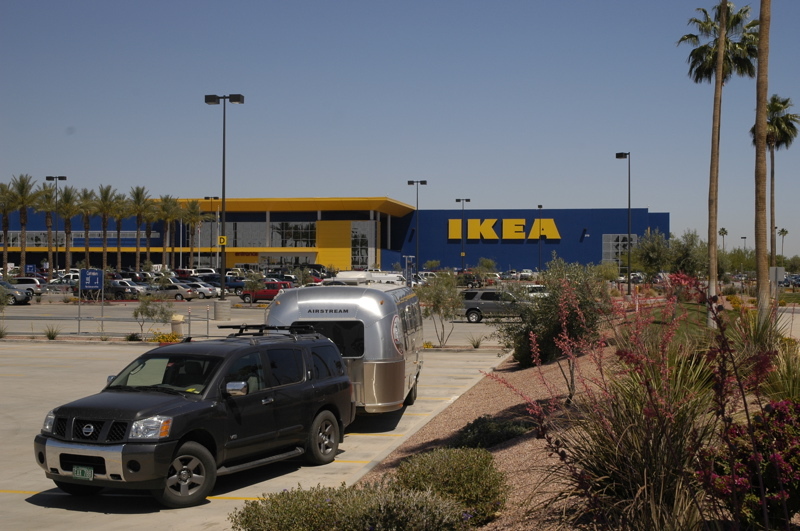 We pulled out of Picacho Peak State Park around 10 a.m. and made our first stop at the new IKEA store in Tempe. Being future homeowners, we are thinking about the things we’ll need to buy to outfit the house. So we parked the Airstream in a corner of the parking lot and spent a couple of hours making notes inside the store. While we were inside, browsing and then having lunch (Emma had the Swedish meatballs), the temperature outside once again soared into the upper 90s. The inside of the trailer was 100 degrees when we came back to it, but fortunately I had remembered to turn on the refrigerator boost fans and so the fridge was comfortable at about 42 degrees. Plowing through Phoenix-area traffic on I-17 is not much fun, but we had little choice of an alternate route since our next stop was a restaurant a few miles further north, where we had planned to meet a friend. Normally we don’t have the trailer behind us when we are doing errands around town, so at all times the consideration of where we could go with our 50-foot parade was paramount. This makes for tricky logistics but we have a lot of experience at this game so it worked out just fine. From Prescott we headed north up I-17 and then west to Prescott. Prescott is an absolutely beautiful place dotted with eroded granite outcrops called the “Prescott Dells”, buttes, and rocky mountains. Being about 5,300 feet in elevation, it’s also much cooler than down in Phoenix and Tucson, so this was the time to come up here. 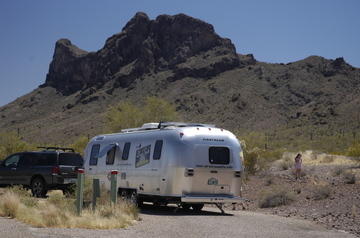 We’ve joined up with our friend Rich C (gadget) and our new friends Brent, Tiffany, and their two children, who also have an Airstream Safari 30 bunkhouse just like ours. I can’t begin to convey the natural beauty of the area we are camped in, so I’ve uploaded a few pictures from our hike this morning with Rich C and the kids. You can find them on our Flickr album. 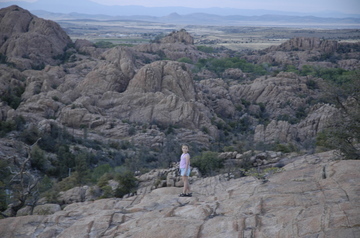 The pinkish-orange granite dells surrounding us are magnificent to hike and climb on. They are very similar to the exposed granite of Acadia National Park, in Maine. Even the campground is absolutely amazing, with most campsites surrounded by giant rock walls. I am sure that this area will be a favorite spot for us to return to, once we are established in Arizona. It’s a cool respite from desert heat, and a great jumping-off point for other beautiful spots such as Sedona. The early start I had envisioned didn’t happen. I was up at 6 a.m. with the sun while the temperature was still a lovely 68 degrees, but Emma didn’t wake up until after 9 a.m, and then with some slight work emergencies and puttering around it was nearly 11 before we found ourselves at the trailhead. 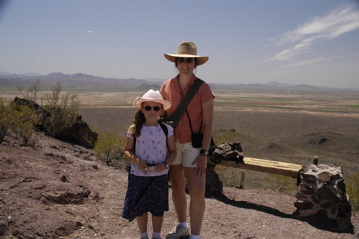 It was also 88 degrees by then, so we were expecting a challenging hike. 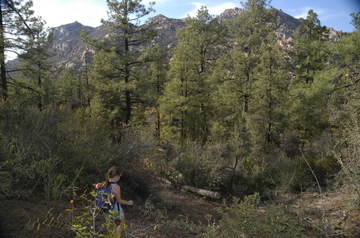 The Hunter Trail is 2.1 miles to the peak, and climbs 1,500 feet in that short distance. The trail is also rocky and difficult, with numerous switchbacks and several steep sections that require scrambling over sharp eroded lava. 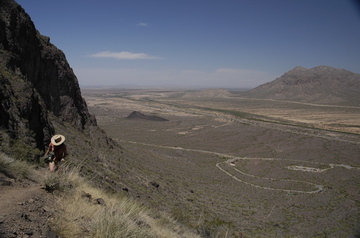 About 2/3 of the way, the trail doubles back and crosses over the range at a saddle. At this point we had gained about 1200 feet of elevation in about 1.4 miles, and it took about 90 minutes. At this elevation (close to 3,000 feet) it was beautifully cool and the view was stunning. We stopped for lunch and a rest in the shade. The trail beyond the saddle drops steeply before climbing again, and is not recommended for children under 10 or inexperienced hikers, so we decide to turn around there. Emma was disappointed in this decision. Along the way up, she was telling other hikers of her conquest at Glacier National Park (“12 miles!”) and so bailing out on a difficult hike after only a mile and a half and 1200 feet of vertical ascent was, to her mind, just plain weenie. Still, coming back down was no picnic, and we were consuming water at a high rate. I drank about 36 ounces of water during the hike and more afterward. Reaching the bottom we found 92 degrees waiting for us. The good news is that the little roadside village at the interstate highway includes a Dairy Queen … and DQ means Blizzards, which are concoctions of ice cream and ground-up candy bars. That, and a quick cold shower for everyone brought us back to life for the rest of the afternoon while we waited for the heat to abate. 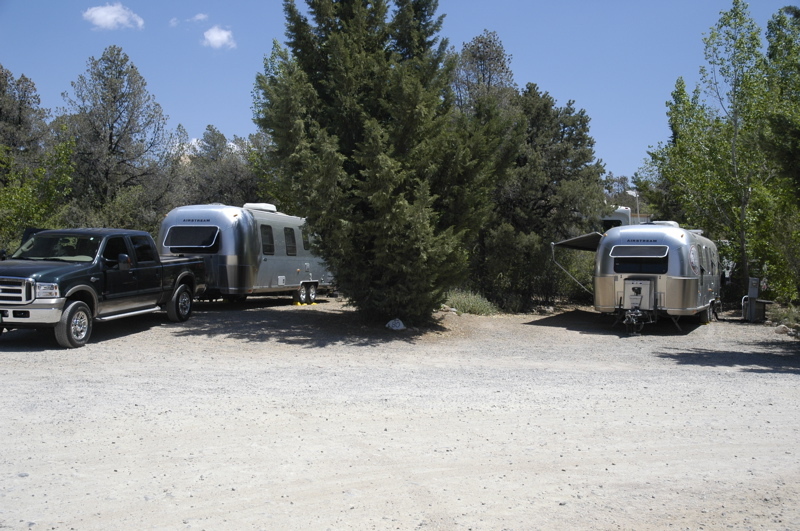 Boondocking report: We used 58 amp-hours yesterday and overnight, mostly to run the laptops, lights in the evening, the refrigerator boost fans, and all three Fantastic Vents. Normally we’d regain all of that in a sunny day (this time of year). But today, with a few hours of laptop time and fans running constantly, we were only able to pick up a net of 23 amp-hours over what we used. So we’re about 35 amp-hours below our total capacity of 300 amp-hours. That’s not a problem, but it does show that in very hot weather we use more power than we can regenerate. If we had tilting solar panels on the roof we’d probably generate much more power, but I haven’t yet seen the solar panel mount that would work for our situation. Since we can’t readily access our roof, such a system would need to be tiltable from the ground, using a pole or something. The new dual refrigerator boost fans are working well. Our refrigerator has maintained 40-42 degrees all day, which is a huge improvement over its prior performance in hot weather. We run the fans all day and turn them off at bedtime, when the ambient temperature is below 80 degrees. There are other little attractions in this area, including an ostrich farm ($5 to feed the birds if you care to), the “Arizona Nut House”, and two more of the ubiquitous tourist souvenir shops operated by Bowlin’s. I think we’ve captured the best of the Picacho Peak area already, so while we might stop in at the nut shop on our way out tomorrow, we’ll pass on the rest of the stuff. Our plan is to head up through Phoenix and into Prescott, where the elevation is much higher and the temperatures are perfect right now. 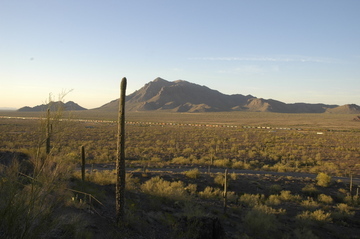 Only 60 miles up I-10 from our spot in Tucson is a beautiful patch of open desert with a stark jagged peak standing up. 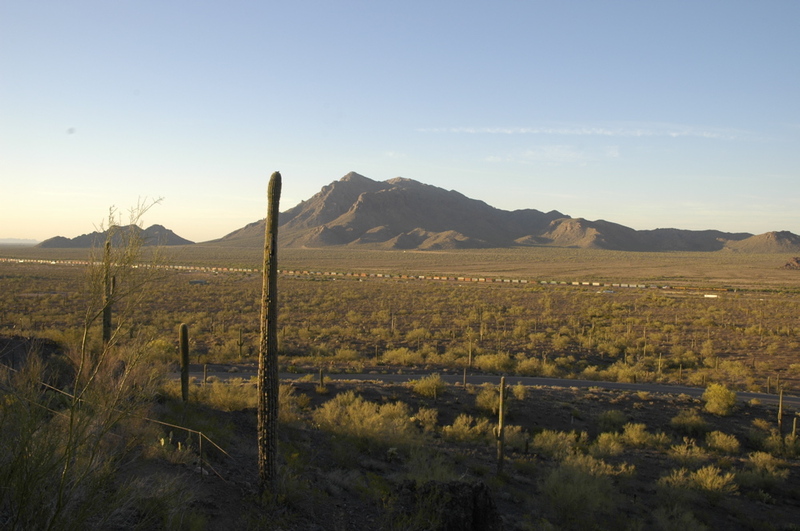 This is Picacho Peak, centerpiece of Picacho Peak State Park, our home for the next two nights. I am impressed with the beauty of this park. It sits on a small rise above the desert floor, so that almost everywhere you go the view is magnificent. Because it’s a low altitude park (and thus already getting warm this time of year) this is the off-season and there are few people here. We had our pick of spots. The interstate highway and a freight line run down below the park, but we can hardly hear them. We chose the non-electric loop just for fun. We’ve had full hookups for months now, and it feels like time to do a little boondocking again. There’s so much sun now that it’s hardly a challenge, at least from an electricity standpoint. Photographically this park is wonderful. As the sun moves, every view changes right up to the last second of light on the horizon. 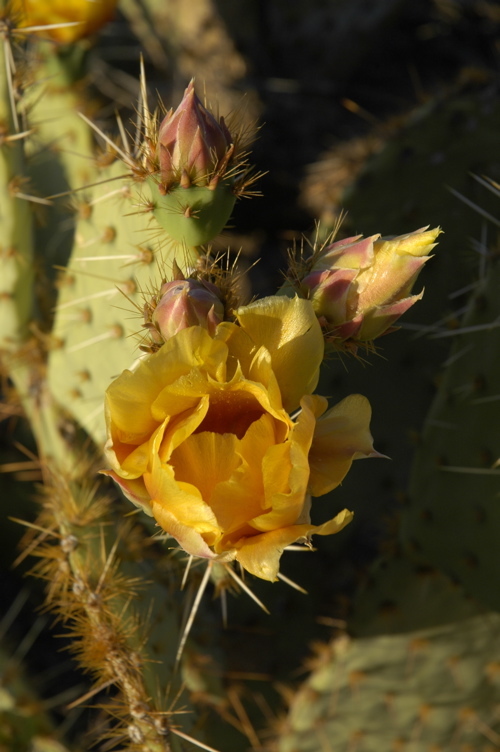 There are all kinds of plants and creatures living on this tiny island in the desert, and right now a few of the cactus are flowering. In just an hour hiking around I managed several nice photos, which I’ve posted on Flickr. The heat has arrived. Today it was 90 and so we spent the afternoon with the fans running, some cold drinks, and a book for everyone. By 5 pm it was cool enough to go for a short hike and do some scouting for a big hike tomorrow. Since it will be hot again tomorrow, we’ll try to get an early start and hike all the way up to the peak. Google Earth location of our campsite at Picacho Peak State Park. Today was a rare bust. We were planning to leave Tucson and head northwest, but suddenly a pile of work issues popped up and the next thing I knew it was 11 a.m., check-out time, and I was still in my pajamas in front of the laptop. So we paid for another day and I spent the rest of the day tapping the keys. We’ll hit the road tomorrow instead. One reason I was so busy is that a few last-minute touches needed to be made on the Summer magazine. I finished editing it six weeks ago, but there’s still work to be done as the layouts are completed, and when it goes to the printer there are still more tasks. Since we’ve completed the bulk of the work and it’s now mostly in the hands of the printer, I can take a moment to share with you a peek into the process. Long-time readers of this blog know that we test alternate covers before choosing the final cover of the magazine. The image above is one such test (headlines are taken from the previous issue). Here are two other tests we did for the Summer issue (above, and below). We also considered several other photos. None of them made the final cut. You’ll have to wait for the issue to appear in print, later in May, to see the image we ultimately selected! 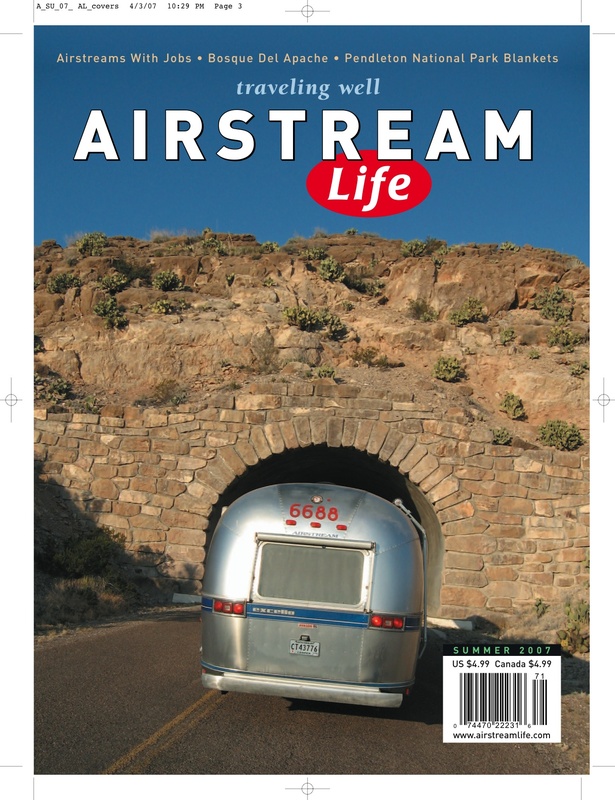 Starting with the Fall issue, Airstream Life will have two covers: one for subscribers, and another for book stores. The photos will be the same, but the headlines will be different. Subscribers will see only the three small headlines above the magazine’s title, which we’ve always put on the cover. Copies intended for book store distribution will have more headlines (called “sell lines” in the industry). 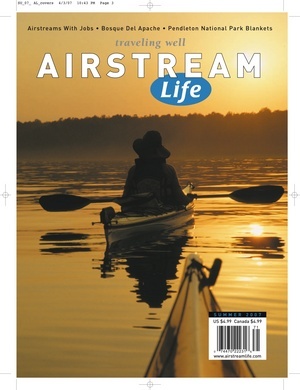 So a benefit of subscribing will be to get the cleaner-looking cover (and at a better price). I’m going off the track a bit here tonight, for two reasons: First, we haven’t done a single thing today worth blogging. Really. 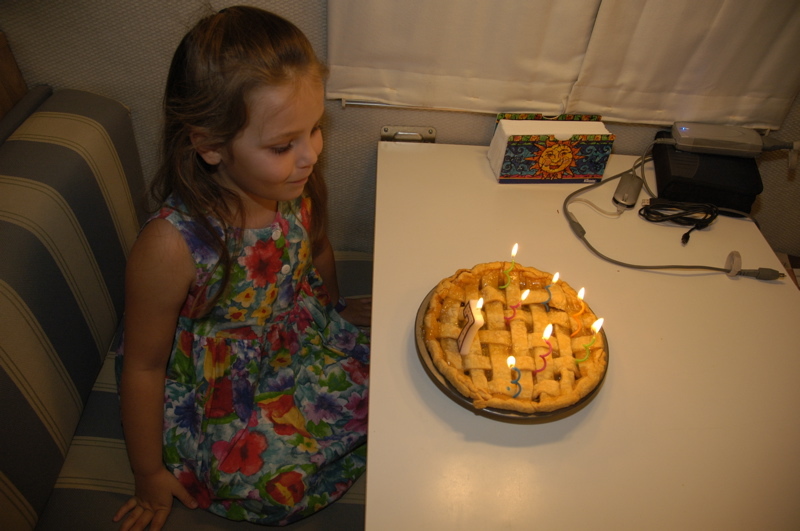 Second, it’s my blog and I can write about whatever the heck I want, right? OK, now that we’re all clear on that, I’m going to do a little housekeeping and mention a few utterly unrelated tidbits that I need to get off my chest. 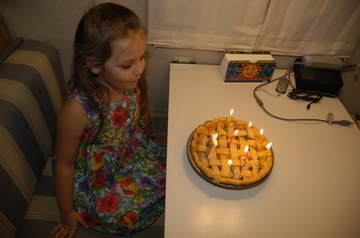 Item 1: Generators are not efficient at charging batteries. All the time I get inquiries from people asking if we tote a generator around. I got one such query this morning. You can skim the old blog entries using the Search box to the left to pull up our history with the generator, including why we got rid of it. But here’s the short version: generators are great for powering electrical appliances that use a lot of AC power, such as a microwave, air conditioner, hair dryer, toaster, etc. But when you plug your RV into one and wait for it to re-charge the batteries, you’re fighting an uphill battle. A partially-charged battery can only accept a certain rate of charge, which declines as it gets fuller. It doesn’t matter how big your generator is. If the battery is more than half full, it probably won’t take even 1/10th of the power the generator is putting out, which means you’re making noise and smoke for not much return. Battery charging happens slowly. That’s why we don’t carry a generator. Solar has proved much better for our style of camping. 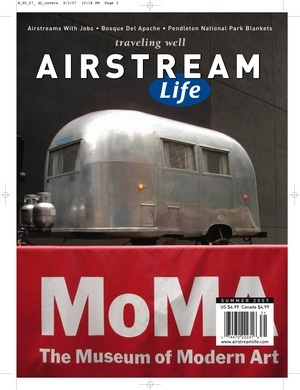 Item 2: Airstream Life is coming to a bookstore near you. Well, it is if you live in one of the 19 states which have Books-A-Million stores. All 155 Books-A-Million stores will have copies of the Summer 2007 magazine, which should be on sale by May 22. Find a Books-A-Million store near you. 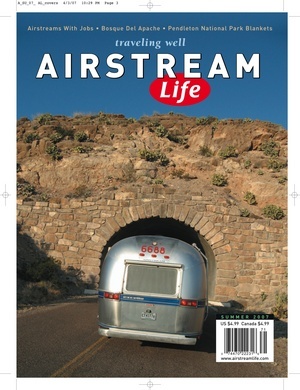 Of course, you already subscribe to Airstream Life magazine, don’t you? (You don’t have to own an Airstream to enjoy it.) So tell your wanna-bee friends to look for it at Books-A-Million stores and buy a copy at the newsstand price of just $4.99 per copy. Item 3: Yogurt should not have pectin in it. (Hey, didn’t I warn you this was random?) For some reason, most yogurt brands sold in the United States have either pectin or gelatin, or both, added to them. I find this annoying. It changes the texture of the yogurt, makes it slimy, in my opinion. Why do manufacturers do this? I’ll bet if asked they’d say the American consumer prefers it this way, but I think they have other reasons having to do with manufacturing cost. They also seem to load up with pectin on the fat-free and low-fat varieties, probably to make up some mouthfeel lost when using low-fat milk. Attention yogurt makers: yogurt should contain MILK and CULTURES. Period. No gelatin, modified food starch, artificial sweeteners, etc. Brown Cow is my current favorite brand. I eat plain yogurt, a habit I developed as a youth making my own in a Salton Yogurt Maker. Brown Cow’s has a delicious taste, and nothing added. But it’s hard to find. We’ve visited grocery stores all over the country and I can only find it once in a long while. So I welcome nominations of other brands that are pectin-free, gelatin-free, and free of everything else except milk and beneficial active cultures.